Last year I participated in an event called Food Blogger Love where participants are assigned a blog to “show some love to” on an specified day. Well, it’s that time again! The event is hosted by Allison of The PinterTest Kitchen. I was assigned to Amy’s blog, Amy’s Cooking Adventures. Amy and I participate in a lot of the same blogging events so I am pretty familiar with her blog. Amy is a mom of two and used to stay at home, but has recently taken a full-time position at her son’s school. Now she’s relegated to trying out new recipes on the weekend like the rest of us. 🙂 As I was reading through her blog, I found out that we have a few things in common. First, neither of us are horror movie fans and second, we both love reading. In addition to recipes, Amy also provides book reviews for all the books she has read on her blog, and believe me when I tell you there are hundreds! My Amazon list of books to purchase has a significantly increased recently, all thanks to her reviews. One thing that cracked me up was how real Amy keeps her blog, whether it’s a about a book or a recipe. In her recipe for buffalo cauliflower she makes sure to point out that it’s cauliflower and not pretending to be something it’s not. I can’t tell you how many recipes I’ve read where a blogger claims a healthier version of something is completely comparable to it’s less healthy counterpart. Look, a cauliflower “steak” is never going to taste like a filet and a frozen dessert made with bananas is never going to become ice cream, so let’s just stop pretending, okay? For #FoodBloggerLove, we can make one of their blogged recipes, recreate a recipe in the bloggers style, make a recipe that fits their lifestyle, etc. This year I chose to make one of the recipes Amy has already shared. 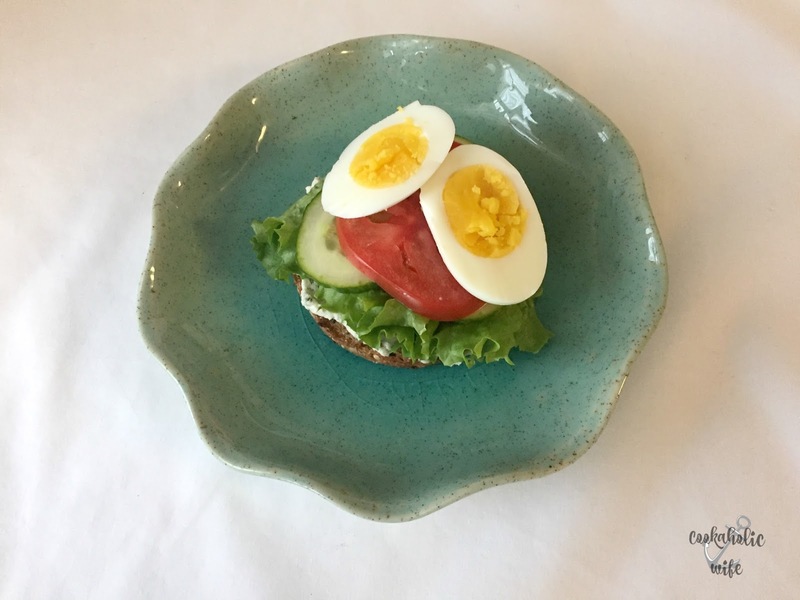 Made with fresh veggies and hardboiled eggs, this sandwich doubles as a mini salad and is great for breakfast, brunch or lunch! 1. Toast the English muffin until lightly browned on either side. 2. Spread the cream cheese on both halves on the English muffin. Top one with lettuce, tomato slice, cucumber and hard boiled egg. Top with the other half of the English muffin. *Note: to make compliant for the Fast Metabolism Diet, use 2 tablespoons of Kite Hill Chive Style Cream Cheese Spread and a compliant muffin or bread. This is such an easy recipe to put together. Hard boiling the egg takes the longest, but you could easily make up a batch of those for the week and simply assemble them onto your sandwich each morning for breakfast. Using a flavored spread instead of a mayo on the sandwich adds a new depth of flavor and lends it more to a breakfast or brunch time treat, but you could really have this when ever you wanted! 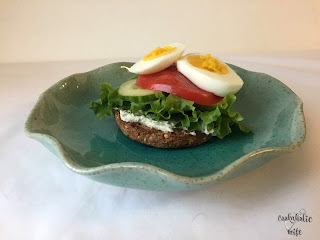 While this recipe was the one to win me over, there are quite a few others on Amy’s blog that I can’t wait to try out, like Irish Nachos, Brownie Oatmeal Cookies and Strawberry Caprese Salad. You can read all of Amy’s delicious recipes here on her blog, Amy’s Cooking Adventures. I think it's kinda fun when you get a blogger with whom you are familiar and take a look at their blog with different goggles on. Simple and delicious sandwich. Looks yumm!! I agree completely about pretend food! Great sounding salad! What a quick lunch! Yum!